Will a common word lead to a common deed? That’s the challenge that the “Common Word” group of Islamic scholars has posed at its fourth major Muslim-Christian dialogue conference now underway at Georgetown University in Washington. The group, which next week marks the second anniversary of its launch, has broken the ice with Christian leaders and fostered a lively and fruitful interchange with them. But it always said its goal was not simply to have more harmonious conferences among theologians. They want to make a real impact lessening tensions between Christians and Muslims out in the real world. Readers of this blog may remember our reporting from the Middle East last May, when we pointed out that the same Pope Benedict who had hinted at a deep suspicion of Islam in his 2006 Regensburg speech had changed his tune and was borrowing the Common Word group’s arguments to argue for deeper Christian-Muslim dialogue. That was no small achievement itself — just ask yourself: how many Catholic theologians were able to change Cardinal Ratzinger’s mind? — but the group has higher ambitions. Reviewing the first two years of the Common Word initiative, Prince Ghazi noted, on the positive side, “the apparent thaw in relations between Muslims and the Vatican, coupled with H.M. King Abdullah of Saudi Arabia’s interfaith initiative, and President Obama’s Cairo Speech on June 4th 2009 – all this being reflected in the latest Pew polls which show a slight lessening of animosity between Christians and Muslims globally.” He also praised initiatives by supporters of the Common Word such as London Church of England Bishop Richard Chartres’s St Ethelburga’s Centre for Reconciliation and Peace, Tony Blair’s Faith Foundation or Miroslav Volf’s Reconciliation Program at Yale University. He said a Common Word “sub-office” had opened in the Pakistani capital Islamabad to promote Muslim-Christian understanding in a country where the Christian minority is under attack. gojra But he added that “Muslims and Christians as a whole still harbour deep and dangerous animosities and prejudices towards each other. Moreover, even if we were to agree that the situation is better in Iraq now than two years ago, we must admit that it is worse in Afghanistan and that a new war has opened up in Pakistan, which in turn has been manipulated to commit murders against the native Christians there, such as recently happened in Gojra.” In the southern Philippine province of Mindanao, he said, the collapse of a planned peace deal had led to renewed fighting with thousands killed and around a million refugees or displaced people. “In short, we are still a long way away from where we could and should be,” he said. What do you think? How can Muslims and Christians use interfaith understanding to foster practical steps towards peace in the world? 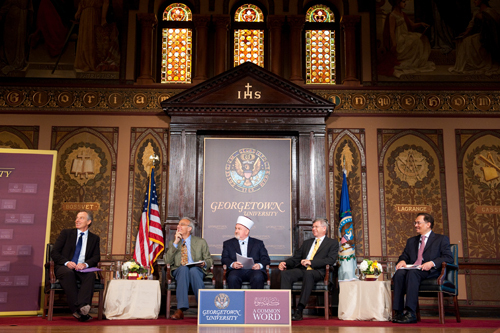 Click here to watch the video of the first session, with addresses by former British Prime Minister Tony Blair, Georgetown University Professor John Esposito, Bosnian Grand Mufti Mustafa Ceric, former Norwegian Prime Minister Kjell Magne Bondevik and former Malaysian Deputy Prime Minister Anwar Ibrahim, as well as a Q&A session.